The government shutdown has affected everyone and everything from families to companies but one outcome that no one saw coming, a Twitter blackout. The U.S. Capital, FAA Safety Alerts, NASA Voyager, LBJ Library, even the National Zoo all took part in this no social media communications. With the government being shut down this is not only putting a halt to working in the office, but to those who handle these governmental social media sites as well. This means no posts, no explanations, and no responding to comments and questions. These agencies have closed off their doors of communication to the public, via social media, completely. Social media has not been around for that long. While the U.S has experienced a government shut down in the past, it has been 18 years since something of this magnitude has struck our nation. Social media was unheard of 18 years ago, thus causing this to not even be an issue. Today, social media has become one of the leading sources of information and a powerhouse in keeping the public connected. The government shutting down this outlet of communication has resulted in a form of crisis communication. The purpose of agencies having social media outlets are to protect and defend individuals, companies and organizations when in the midst of a public challenge. In retaliation to these “Twitter blackouts,” American citizens have turned to social media to voice their disgust. According to an article in Forbes, opinions have turned into hash tag campaigns including one of the more popular, #DearCongress. Citizens are communicating their disappointment and shock with some serious feedback. Most of these opinions focus around lawmakers and officials continuing to draw salaries during this shutdown while employees of these agencies go unpaid. Many people also agree that the government is participating in a disservice by shutting down their social media as well, seeing this decision as a sign of weakness. Being human, we all want answers. Everyone wants to know what it going on and why. If American’s can’t get their information from trusted government sources, they will surely go elsewhere to find answers. Following the crisis management theory would provide government officials and those responsible for running social media sites like Twitter, with a proactive plan to follow in order to maintain a positive reputation. However, rather than taking advantage of this opportunity to stimulate debate and discussion around these critical issues, the government is taking the easy way out by hanging a figurative “do not disturb” sign on their Twitter accounts. The shutdown was a horrible mess and I wish that it didn’t happen. But in the face of it happening I think silencing the Twitter accounts was the right thing to do. Quite honestly I wish a lot more things had been shutdown. The threat of a shutdown wasn’t enough, because it was only a partial shutdown. What if during a shutdown the FAA and TSA suddenly decided to be totally closed, how fast would congress have reacted with no plane flights across the U.S. What if we shutdown all Visa and Passport operations. With no one legally allowed to reenter the US how fast would they have reacted then. Shutting down parks??? Oh no, I’ll just have to go enjoy the outside somewhere else. Not really a threat. Now I was furloughed, so believe me I never wanted a shutdown. 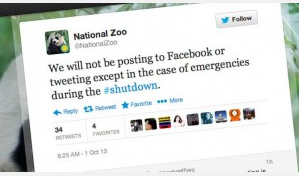 But I can honestly say that the shutdown wasn’t taken far enough. My humble opinion of course.